macOS Mojave is now available as a free software update for Mac users. It’s available at the Mac App Store. 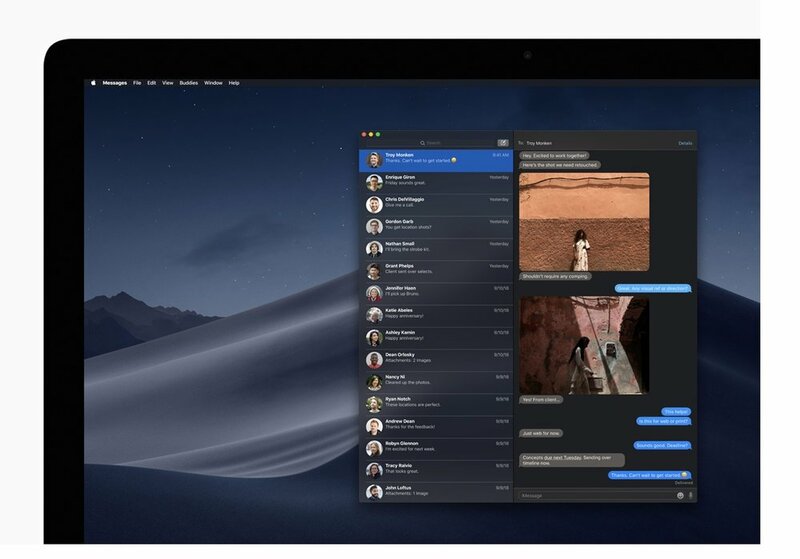 macOS Mojave brings a number of new features to the Mac, including Dark Mode which transforms the desktop with a dark color scheme, and a new Dynamic Desktop with a series of time-shifting images to match the time of day. Stacks cleans up messy desktops by automatically organizing files into neat groups. The Mac experience is also enhanced with the arrival of familiar iOS apps, including News, Stocks, Voice Memos and Home, and a redesigned Mac App Store. Dark Mode transforms the desktop with a dark color scheme that highlights content. It’s designed to make it easier on the eyes, especially when working in low light such as in a darkened room or on an airplane. Dark Mode is integrated across built-in Mac apps including Mail, Messages, Maps, Calendar and Photos. Users can enable Dark Mode in System Preferences; third-party app developers can also integrate Dark Mode in their own apps. Stacks clears cluttered desktops by automatically organizing files into groups based on file types like images, presentations, PDFs and text documents. Users can also customize Stacks to sort based on other file attributes, including date and tags. Stacked files can be accessed by clicking to expand a Stack and then opening a file. 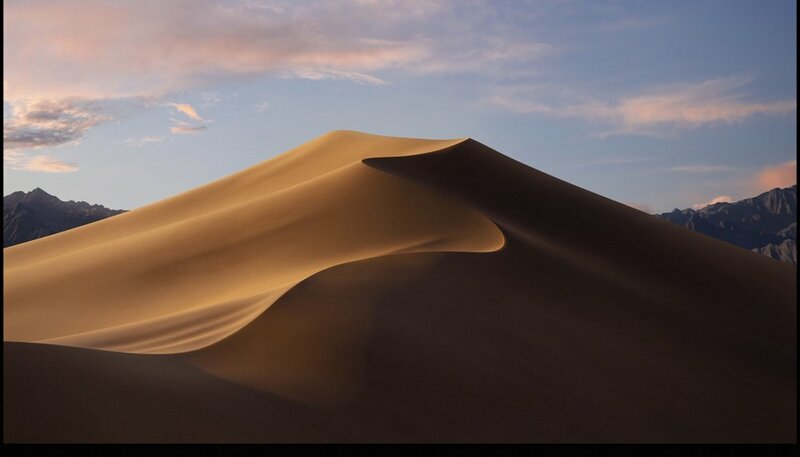 The macOS Mojave desktop background features a series of images that shift to match the time of day wherever a user is in the world. The desktop, featuring the rolling sand dunes of the Mojave Desert, transitions with different lighting variations based on the time of day, from dawn to morning, midday, dusk and evening. Finder in macOS Mojave features an all-new Gallery View that lets users skim through files visually, while a Preview Pane shows all of a file’s metadata. Quick Actions now appear in the Preview Pane within Finder and allow users to do things like create and password-protect PDFs, and even run custom Automator Actions. Quick Look now lets users rotate and crop images, mark up PDFs and trim video and audio clips and can be accessed by selecting a file and pressing the keyboard space bar. Screenshots delivers on-screen controls for quick access to screenshot options and new video recording capabilities. This feature can be accessed by launching the Screenshot utility or pressing shift-command-5 to access a series of controls to capture still images and videos of a Mac screen, including options for setting a timer and even choosing where to save screenshots. With Continuity Camera users can shoot or scan a nearby object or document using their iPhone, and have it appear on their Mac. Users need to simply choose “Import From” in Pages, Keynote, Numbers, Notes, Mail and other supported apps to scan or shoot using their nearby iOS device. News provides a one-stop destination for news and information, curated by Apple editors and personalized for each user. Stocks provides a way to track the market, delivering curated market news alongside a personalized watchlist complete with quotes and interactive charts. With Home, users can control their HomeKit-enabled accessories, from turning on lights to adjusting a thermostat or checking a baby monitor. Voice Memos is designed to make it easy to record personal notes, lectures, meetings, interviews or song ideas with the Mac’s built-in microphone and then later access them through iCloud from iPhone, iPad or Mac. The Mac App Store is completely redesigned and, according to Apple, now features rich editorial content that makes it easier than ever to find Mac apps. A new Discover tab highlights the hottest new apps for Mac, while Create, Work, Play and Develop tabs help users find apps for a specific project or purpose. Stories, collections and videos help you find apps with in-depth information and insights about them and the creators who use them. In Safari, enhanced Intelligent Tracking Prevention helps prevent social media “Like” or “Share” buttons and comment widgets from tracking users without permission. Safari also presents simplified system information when users browse the web to prevent data companies from creating a unique “fingerprint” that can be used for tracking. To help users better manage their passwords, Safari now automatically creates, autofills and stores strong passwords when creating new online accounts and flags reused passwords so users can change them. Safari now supports website icons in browser tabs so users can identify their open tabs with a glance. Website icons can be enabled in System Preferences. Mail now features an Emoji menu right within the Mail composition window, making it easy to add Emoji to email messages. Siri on Mac now lets users control HomeKit-enabled devices and also has improved knowledge of food, celebrities and motorsports. UK English, Australian English, Canadian French and Traditional Chinese for Hong Kong system languages are now included in macOS Mojave, as well as improved maps for China and romanized English input for the Japanese keyboard.